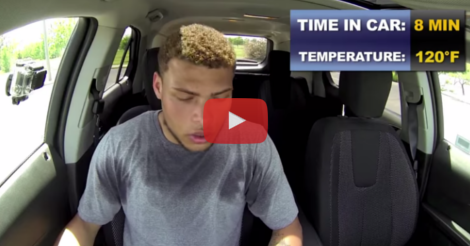 This NFL Player Sits In A Hot Car For 8 Minutes And Nearly Passes Out. I’m Stunned. For dog owners, seeing a dog left in the car with the windows rolled up is terrifying. Leaving a living being trapped in a car that is over 100 degree Fahrenheit is unthinkable torture, and it’s just terrible that some people still don’t understand that it only takes a few minutes before their dog will die of organ failure in this death trap. If you see a dog in a hot car, call the police and find out if your state allows you to break a window in order to save the dog. “If you’re going to make a dog a part of your family, then make him a part of your family. Don’t treat him like you wouldn’t treat someone you cared about or someone you loved.” Says Tyrann Mathieu, the Cardinals devensive back who teamed up with PETA to give this issue a more personal touch. Within 7 minutes, the temperature rose over 30 degrees Fahrenheit. He could only last 8 minutes in this car before escaping the heat and nearly passing out. He just couldn’t take it anymore. This is something that a dog can’t do. When a “quick trip” into a store might last only 10 minutes, if the temperatures are hot enough, you dog might have already gone into organ failure. Be mindful of your pets and stay safe in the hot weather! This Woman Has Tattoos All Over Her Face. The Reason Blew Me Away! WOW! This Mom Realized That She Loved Herself, But She Didn’t Love Her Body. She Started Doing THIS And Everything Changed! OMG!